Disney Pixar's Coco has had no trouble taking home the box office crown in its first two weekends in theaters, and thanks to minimal competition this weekend, it's on track to win for a third weekend win in a row. The only new movie opening in wide release at the box office is Broad Green Pictures' Just Getting Started, which doesn't have a theater count estimate or a Rotten Tomatoes score yet, but still isn't expected to give Coco much competition. 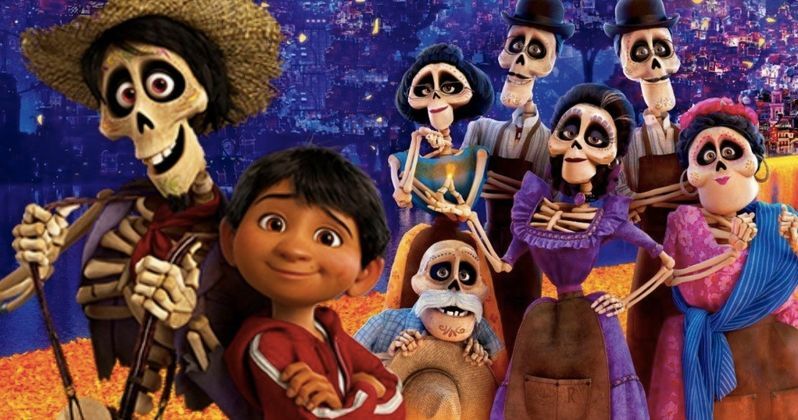 While it certainly won't be pretty, we're predicting that Coco will pull off its third win in a row with $14.5 million. Will Coco be able to pull off the coveted three-peat at the box office? This year hasn't been kind to repeat performers. Though some movies have managed to stay in the public interest a lot longer than others. Split was the first movie of the year to win the three-peat crown at the box office way back in January. And Fate of the Furious also pulled three weekends in a row back in April, just before the summer movie season got underway. Wonder Woman failed to achieve this high water mark, as did Guardians of the Galaxy 2. Surprisingly, Hitman's Bodyguard was the next to achieve this box office feat, arriving at the tail end of summer when the box office was completely dead in the water. Both Thor Ragnarok and Justice League also failed to hold on for three weekend wins in a row. But they're both in the top ten this week, so audiences haven't given up on them just yet. Even Beauty and the Beast, which is the highest grossing movie this year, couldn't do it. Last weekend at the box office, Pixar's Coco took in $27.5 million in the top spot, representing a minimal 45.8% drop from its opening weekend, which isn't surprising since last weekend featured no new movies opening in wide release, although there were plenty debuting in limited release in New York and L.A. One of those movies that fared well in limited release last weekend, A24 Films' The Disaster Artist, which earned $1.2 million from 19 theaters for a $63,755, is expanding this weekend to roughly 800 theaters, which should be enough to have the movie crack the top 10, since it came in 12th place last weekend. Regardless, neither The Disaster Artist or Just Getting Started will put up enough of a fight, resulting in Coco pulling off a rare three-peat. As it stands right now, Coco has earned $110.1 million domestically and $172.3M, which includes a Mexican box office record of $53.4 million, unseating the five-year record held by Marvel's The Avengers. The movie has had an incredibly strong showing with critics as well, with an astounding 96% rating on Rotten Tomatoes. While it will likely manage to remain atop the box office, this will certainly be its last hurrah at the top, with Disney's massive blockbuster Star Wars: The Last Jedi opening in just 10 short days, which will most likely be the biggest movie of the year in every category. Despite his family's baffling generations-old ban on music, Miguel (voice of newcomer Anthony Gonzalez) dreams of becoming an accomplished musician like his idol, Ernesto de la Cruz (voice of Benjamin Bratt) in Disney Pixar's Coco. Desperate to prove his talent, Miguel finds himself in the stunning and colorful Land of the Dead following a mysterious chain of events. Along the way, he meets charming trickster Hector (voice of Gael García Bernal), and together, they set off on an extraordinary journey to unlock the real story behind Miguel's family history. Character actress Renée Victor also joins the cast as Abuelita, Miguel's grandmother. We're predicting that the weak top 5 will be rounded out by the DCEU's Justice League ($8.6 million), Wonder ($6.4 million), newcomer Just Getting Started ($5.1 million) and Thor: Ragnarok ($5 million). The top 10 will be rounded out by Just Getting Started, an action comedy in the vein of Midnight Run (1988), about an ex-F.B.I. Agent (Tommy Lee Jones) and an ex-mob lawyer in the Witness Protection Program (Morgan Freeman) having to put aside their petty rivalry on the golf course to fend off a mob hit. Rene Russo, Glenne Headly, Joe Pantoliano and George Wallace also star in this new movie from writer-director Ron Shelton (Bull Durham). Also arriving in limited release this weekend is Neon's I, Tonya and a pair of Vertical Entertainment movies, November Criminals and Hollow in the Land. Looking ahead to next weekend, according to Box Office Mojo, Disney and LucasFilm will finally unveil Star Wars: The Force Awakens, while 20th Century Fox rolls out the animated family comedy Ferdinand in theaters. Also arriving in limited release next weekend is Magnolia's Permanent and Vertical Entertainment's Beyond Skyline. Take a look at our top 10 projections then check back on Sunday for the top 10 estimates. Is Pixar's Coco the Box Office Savior Hollywood Has Been Hoping For?